In this blog we want to give a brief overview of what Bluetooth Smart is and what it can be used for. Equally we will discuss the type of use cases that it is NOT suitable for. Bluetooth Smart (aka. Bluetooth Low Energy or BLE) is an entirely new mode of communications introduced by the Bluetooth SIG in V4.0 of the core specification. So what are the key differences between Bluetooth Smart and Classic? In Bluetooth Smart the roles of the two devices have been reversed, with Bluetooth classic (such as what we use for hands-free kits in cars) the 'master' device was typically the mobile phone, it sent out a broadcast message when it wanted to see what devices were in close proximity which meant that the peripherals had to be awake all of the time listening for incoming requests. This meant they were very power hungry. In Blueooth Smart it is the peripheral (such as a sensor or wristband) which 'advertises' its presence on a regular interval so that a mobile phone can listen occasionally for a short period of time to see what peripherals are in close proximity. Because this advertising only happens infrequently and lasts for only a few microseconds then the average power consumption is tiny. Bluetooth Smart also introduces some new concepts for the exchange of data. A profile will include one or more services and each service includes one or more 'characteristics'. These characteristics are the logical objects through which data is exchanged. They can be thought of as memory shared by the two devices where each device has the potential to write data to, and read data from that memory. If a peripheral device writes some data into a characteristic then the underlying link layers will transport that data to the mobile phone and, if set up correctly, notify the phone App that the data has been changed by the peripheral. The mobile phone App can then read that data. The mobile phone can also write to characteristics to send data to the peripheral. 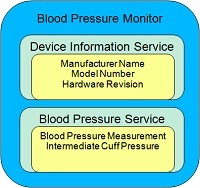 In the following highly simplified example a peripheral has a Blood Pressure Monitoring profile which contains two services, the first is a Device Information Service which contains details of the device such as model number. The second service is the Blood pressure monitoring service and it contains two characteristics each of which is used to exchange data relating to the readings it is taking. This use of characteristics enables a very flexible method of exchanging data between peripherals and mobile phones in a standardised and interoperable way. A range of standardised profiles have been defined for many applications but we can also create custom profiles for specific use cases. In summary, Bluetooth Smart is excellent for allowing low power peripherals to connect to mobile phones to send small amounts of data relatively infrequently.